Wide variety of packages with health products in "Zdravnitza". Take now your package and reduce the total cost of the products. Healthy-cosmetic package "Sea Buckthorn" includes: Sea Buckthorn oil, Sea Buckthorn Hair Mask, Sea Buckthotn moisturizing cream. Healthy package "Tribulus" includes: Tribulus Plus - herbal tincture, Tribulus Terrestris - 100 capsules, Tribulus Terrestris - aqueous extract, Miracle - herbal tea. Healthy package "Cough" includes: Herbal mixture for cough and bronchitis, Bulgarian Pine cones honey, Mountain tea, Echinasal - herbal throat spray. Healthy package "Vitamin B17" includes: Apricot kernel oil, Bitter Apricot kernels, bitter, Amygdalin (Vitamin B17). 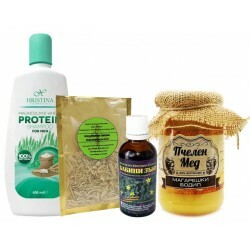 Healthy package "Men's health" includes: Tribulus terrestris - vacuum plant extract, Thistle Honey, Siberian Ginseng, Men shampoo. Healthy package "Black seed" includes: Egyptian Black seed oil, Raw Black seeds, Black seed oil - capsules and natural soap with black cumin. 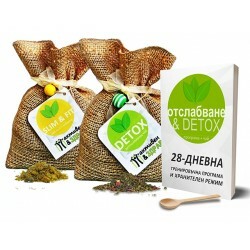 Herbal Package "Weight Loss and Detox"
Herbal pack include Detox tea, Slim&fit tea, Training program for 28 days (in Bulgarian), wooden spoon. 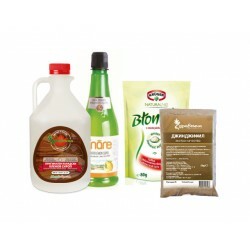 Herbal products - suitable for vegans. 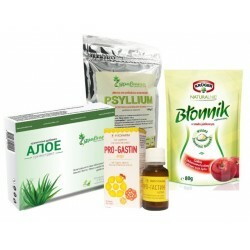 Healthy package "Stomach, intestines, digestion" includes: Aloe capsules - Zdravnitza, Apple (fibers) pectin powder, Pro-Gastin drops, Psyllium - Zdravnitza. Healthy package "Stop Flu" includes: Elderberry syrup, sugar free, Zdravnitza - 550 g, Propolis tincture, Zdravnitza - 30%, Samahan tea, Zeal Plus - lozenges. Healthy package "Beach" includes: Cocoa butter, Sun Protection 15SPF Spray, Kids Sun Protection 30SPF - Moisturizing Spray, After Sun Moisturizing Spray. 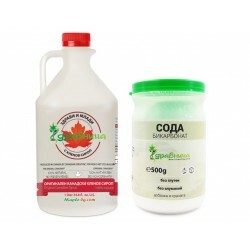 Healthy package "Apple" includes: Apple flour, Zdravnitza - 300 g, Natural Bulgarian Apple Vinegar - 500 ml, Apple Pectin Powder. 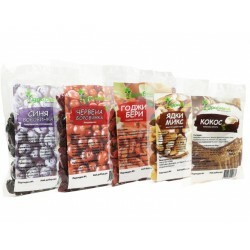 Healthy package "Nuts and Fruits" includes: Dried fruits of Blueberry, Cranberry and Goji Berry, Nuts Mix and Coconut cubes. 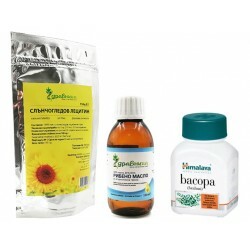 Healthy package "Brain Helath" includes: Sunflower Lecitihin, powder - Zdravnitza, Liquid Cod liver oil - Zdravnitza, Bacopa (Brahmi) - capsules. Healthy package "Immunity" includes: Black seed oil, Elderberry syrup, Sugar Free, Vitamin C - syrup, Triple Echinacea with danewort thicket - tincture. 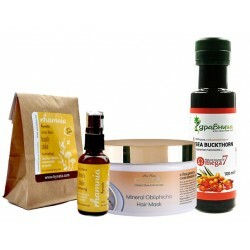 Healthy package "Rosehip" includes: Rosehip oil - Zdravnitza, Soap with rosehip oil, Rosehip oil - 100 capsules, Rosehip flour, Rosehip - dried fruit. Healthy package "Bee kit" includes: bulgarian natural bee honey, bee pollen, propolis - stick and propolis tincture. 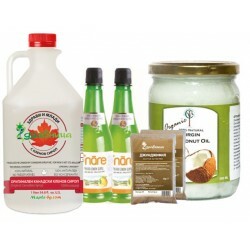 Healthy package "Maple Syrup diet with Coconut oil" includes: Original Canadian Maple Syrup, Lemon juice, Ginger powder, Organic Coconut Oil. Healthy package "Strong Stomach" includes: Apple pectin, Sesame Tahini - Zdravnitza, Psyllium Husks, Pro-Gastin drops. Healthy package "Parasites and Toxins" includes: Diatomaceous earth - 250 g, Troychatka (Wormwood, Clove and Green walnut), Apple pectin powder - 80g. Healthy package "Healthy joints" includes: Collagen Forte, Zdravnitza, Boswellia extract - capsules, Vivalek Cream - massage in body problem areas. Healthy package "Mini Spices" includes: Ceylon cinnamon powder, Turmeric powder, Ginger powder, Vital potassium sat Cardamom green grains. The package contains all the products carrying the Maple Syrup Diet: maple syrup, lemon juice and ginger. 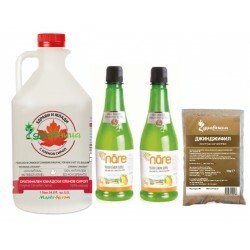 Healthy package "Maple syrup and Soda" includes: Original Canadian Maple Syrup, Zdravnitza and Bicarbonate of soda - Aluminum Free, Zdravnitza. Package 5-7 daily detoxifying program. The products contained in the package will cleanse the body of toxins and help lower cholesterol. Gift Set "Food for the body"
In Gift Set "Food for the body" includes: 1 body peeling, 1 body lotion, 1 shower gel for hair and body and a gift from us - 1 Cream butter arms and legs.